"any pure or applied research that deals with nuclear fission, thermonuclear fusion, antimatter, or any other nuclear reaction, should be severely limited if we wish to avoid a horizontal proliferation of nuclear weapons." "these principles are so simple that a country such as Japan, which has the second most powerful ICF facility in the world, is in a far better position today than the United States in 1952 to make a hydrogen bomb. There is little doubt that if Japan decides to build such a bomb, it would work without failure, even without any previous atomic test." "DOE says the mixed oxide fuel factory will be terminated beginning in fiscal year 2017"
"Building the MOX factory is part of a 2000 agreement between the U.S. and Russia, in which each country would neutralize 34 metric tons of plutonium so the material could not be used again for nuclear bombs. Without the MOX facility we cannot honor our agreement with the Russians"
"So, you plan to reduce the ballistic missile submarine force to just 8 boats, you plan to shelve our plans for a new nuclear bomber, you plan to cancel the Chemical and Metallurgy Research Replacement facility at Los Alamos National Laboratories, and you also want to cancel the Mixed Oxide (MOX) facility. And you want to win the elections. Did we get it right?" "we've been donating some 20 million dollars to key members of Congress with decision making power over nuclear weapons spending using the argument that nuclear weapons are needed now more than ever because of recent geostrategic events; maybe it's time to explain to them that we were not refering to either Russians or the Chinese. Call it 'disclosure' if you wish." "making sensible cuts in the U.S. nuclear arsenal will also require policy makers to take on the money, power and influence of the nuclear weapons lobby"
"We will be vigilant in our opposition to any changes that might reduce the number of ICBMs in the U.S arsenal to levels that might threaten the existence of current ICBM bases. Our efforts are aimed at ensuring ICBM funding is maintained throughout the budget process, whoever the president is." Scho stesh stro blui aba, ir tremitt, akti, gra ma, furze, leha aba atmu nieu abke shra ma hara bred mebse, haru moa ma ir al bron ruifiss ki mal ma giegidd wels lann alar awa kose dahe alar duvo wara kret heis aba hyde ver al dame lekhe troo af tarmitt. Ause sise al roul lurv demness af ause sol la. "We believe in one God, our Creator, Redeemer, and Sustainer who is known through self-revelation as Father, Son, and Holy Spirit. God the Father is holy and sovereign. Yet in his wisdom, God has dared to reveal himself to us as Father in order to make clear to us his personal nature. We do not worship an abstract concept that can be molded to fit our needs, but a personal God who freely chooses us and adopts us as his children. God created everything that exists, including men and women who are created in God's own image. We believe that God's perfect creation has fallen through human sin. We sin when through pride we seek to put ourselves in God's place, or when through sloth or false humility we refuse to be the people whom God has called us to be. We are lost and in need of salvation which God gives to all who believe in and confess Jesus Christ as Lord and Savior." "Only if you have an apocalyptic view of the future to come would you support our mission, and this explains why most key decision makers on nuclear weapons are carefully chosen among those who do belong to either The Church of Jesus Christ of Latter-day Saints or any other Christian faith. When we opt for Howard Philip "Buck" McKeon or Mike Turner or any other, we do it for a purpose." "We have one and the same enemy: the absence of a real enemy. If there's no enemy the entire world would be stagnated, purposeless, devoid of any meaning. This is true both for us and for them. We need a war if we wish to make the world go around." "Man remains what he has always been: just dust." FL-200211 Fluor Corp. and the killing of Lindsey Graham. Defense Report. FL-140111 Edward C. Aldridge and the liquid visitors. Defense Report. 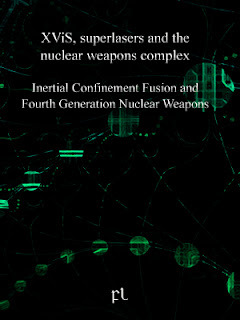 A. Gsponer and J.P. Hurni, The Physical Principles of Thermonuclear Explosives, Inertial Confinement Fusion, and the Quest for Fourth Generation Nuclear Weapons, INESAP Technical Report No.1, Presented at the 1997 INESAP Conference, Shanghai, China, 8–10 Sept. 1997, Seventh edition, September 2000. E.I. Moses, The grand challenge of thermonuclear ignition, Science and Technology Review (Lawrence Livermore National Laboratory, July/August 2005) 3.
on the National Ignition Facility, Phys. Plasmas 11 (2004) 339–491. M. Shmatov, Some problems related to the safety and efficiency of the use of antihydrogen and antiprotons, J. Brit. Interpl. Soc. 58 (2005) 326–331. Amy F. Woolf, Modernizing the Triad on a Tight Budget. Arms Control Today, January/February 2012.